Are you looking for best soundbar under $300? Don't worry, you've stumbled on the right place. Considering the fact that you must have bought brand new television or already have one. Now you're looking to 'up' the audio experience, considering how poor quality speakers are fitted into your big TV. Hence take 5 minutes of your time and discover the best soundbar speakers from well-known brands under $300. Sony HTCT260H is the only Soundbar under $300 that features a hexagonal design. This makes it totally unique from all other soundbars mentioned in our list. 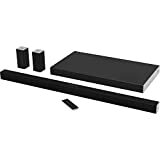 The package comes with a single unit of long 40 inches soundbar consisting of two speakers; also included is a large subwoofer which connects wirelessly to the entire system. This happens to be the best soundbar with wireless subwoofer from a very well known audio brand. Subwoofer produces sound output of 130W; whereas the satellite speakers fused into the sound bar produces sound output of 85W each. Hence the total sound output of the entire system is, 130W + (85W*2) = 300W which is pretty loud to fill a large room. Connectivity options include Bluetooth and NFC allowing to you connect your TV to the Sony HTCT260H via Bluetooth and do NFC pairing with your NFC enabled smartphone. This kind of technology allows for a wireless sound solution. There's one cool feature included in the Sony HTCT260H and i.e. Remote Signal Repeater. Most of the time when your TV isn’t wall mounted; the soundbar sits right in front of the TV. ...and even if the soundbar did blocked the Remote sensor; Sony HTCT260H can catch TV remote signal, duplicate it and send it to TV. "Sound wise, it offers great sound quality and definitely deserves a mention in our list of best soundbar under $300." Featuring a gun metal design and premium looks; the Sharp HT-SB602 is a proud entrant is our list of Sound bar under $300. With a 54-inch wide soundbar, this happens to be a great soundbar for 48 inch TV and more due to its large size. 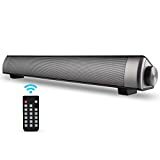 It happens to be a best soundbar with wireless subwoofer which is bigger in length and can be kept anywhere; until there’s an option to connect it to a power outlet. Like our previously mentioned soundbar; the Sharp HT-SB602 features Bluetooth as well as NFC. The total power output from the entire system is 310W. It also includes dual HDMI connectors with both of them featuring Dolby and DTS support. Watching movies on the Sharp HT-SB602 is an incredible pleasure; however same cannot be said about music listening, as you’d tend to miss out intricate details and it’s however the same case with all soundbar + subwoofer system. Gun-metal design on the soundbar gives it a stylish look; however the same cannot be said about the subwoofer. The length is small and height is big and looks pretty generic, and doesn’t complement the excellent design of the soundbar. However do check out its full review. "If you own a small TV of 32-40 inches; do consider dropping the idea of buying this soundbar under $300; as it would look weird for a 54 inches soundbar sit below your dwarf 32 inches TV." In our list of best soundbar under $300, here’s a soundbar with ultra slim design that complements the looks of your TV and happens to be the best soundbar for music listening. Compared to other soundbar in our list; this is the most subtle looking and minimalist soundbar and Yamaha YAS-105 has got it’s design perfectly on the mark. For people who love minimalism (like me); this is definitely a great choice as it has dual built-in subwoofer; rather than a heavy external unit. However it doesn’t comes with NFC and features only Bluetooth, which isn’t a deal breaker as NFC still doesn’t comes standard with many smartphones today. The package comes with optical cable; which can be used to connect to your TV if it has that option; also you can even connect either via coaxial cable or analog cable. Since the subwoofer is built into the unit; the bass isn’t as strong compared to an external unit but that’s manageable considering the amount of space that gets saved. The setup is very simple indeed; out of the box, just connect the Yamaha YAS-105 to a power source and to your TV via coaxial, analog or optical input and you’re ready to go. You can either control the functions of this soundbar under $300 with a remote control or rather via a free Yamaha app. "If you live in a small room and want to save on speakers space; Yamaha YAS-105 is definitely for you." It’s hard to find an audio enthusiast who hasn’t heard about this innately popular audio brand called as ‘Klipsch’. You can be 100% sure that you’re in good hands if you buy an audio product that has written Klipsch over it because the company has been a pioneer in producing high quality audio products at premium price and has been able to retain its stature ever since. After blowing the market by storm by its extremely popular in-ear headphones and bookshelf speakers, the company has been making mark in the Home Audio segment with its soundbar music system. Design wise, the Klipsch R-10B looks very toned down and basic, with plenty of usability options, however it shines when it comes to sound quality and overall features. ...moreover it also comes with wireless subwoofer that hosts a 8-inch driver inside that adds a touch of deep bass to the already balanced sound of soundbar. The soundbar consists of 2x 0.75-inch dome tweeter that features Klispch’s propriety Tractrix horn technology and 2x 3-inch mid range driver as well that offers a 5.1 channel sound experience with a minimal footprint. This Bluetooth-enabled soundbar from Klipsch has the ability to output a peak power of 250W, which is more than enough to fill a large room. Input wise, the Klipsch R-10B comes with 1x optical digital and 1x dual RCA analog, moreover inside the package, the company provides 1x 1.5m optical cable, pair of rubber feet, wall mounting template and remote control along with power supply. The overall sound quality of Klipsch R-10B is very good, and it would be hard for someone to find faults, however some users have noticed a glitch which causes the soundbar to get into full-volume when powered on but this problem can be solved by resetting the soundbar once. Well it isn’t a secret that I’m personally a big fan of Bose products. The reason being not only the sound but also the way they’re designed. Who wouldn’t love spending around $300 on a Soundbar and getting a better treatment on looks? I would love it! Single sound bar provides better sound quality compared to your TV.The Solo 5 TV sound system is an easy solution, with advanced technologies that deliver the clear audio your TV can't. Comparing to other Bose’s Solo series, the Solo 5 is an extremely streamlined and affordable Soundbar music system that doesn’t asks for lot of space. It will quietly sit in front of your TV and the industrial black design makes sure it doesn’t distracts you while watching TV. The other Soundbars mentioned in our list do come with a sub-woofer however the Bose Solo 5 is void of it, however you can connect it an aftermarket Polk Audio PSW10 subwoofer which will make it a complete package. Bose Solo 5 package comes with the Soundbar itself along with a universal remote, power brick and set of cables. This Soundbar is however sleeker, lighter and smaller than other soundbars in our list. It is 21.4 inches long, 2.6 inches high and 3.4 inches in depth, weighing only at 3.73 lbs (the lightest too in our list). It also comes with a universal remote that has ability to control your TV, Blu-ray player and other devices connected to your TV and Soundbar. The remote control also houses a Bass control button that increases/decreases bass on the Soundbar, however is a no replacement to an actual sub-woofer. Bose Solo 5 mostly concentrates on giving you an audio experience that is much better that the speakers your TV comes with. With Bose’s special technology, this Soundbar makes sure that you hear dialogues and intricate sound details without increasing volume. Included Bluetooth feature allows you to connect your smartphone or tablet to the Solo 5 and stream audio. Do check Bose Solo 5 review. ...because well their sound systems haven’t been up to par, well until now. The LG Electronics LAS551H Soundbar is an exciting piece of audio combination put together that will allow you to enjoy your music and movies in illustrious detail. It's the best 2.1 channel Soundbar that is long enough to fit under your 40” inches very comfortably. This Soundbar from LG comes with a sleuth of features that will make your connectivity entirely wireless. It has built in Bluetooth along with HDMI connectivity to connect your TV to this Soundbar via an HDMI cable. It also has something called as Sound Sync Wireless that will allow your LG HDTV to connect wirelessly to LAS551H Soundbar. Included Sub-woofer is completely wireless and you can keep it next to your sofa to enjoy thumping bass while listening to music or watching action-packed movies. Sound quality on this one is highly detailed and the included sub-woofer does add a flair of action to the sound. Though don’t expect audiophile like details from this measly $300 soundbar, however it does lives up to its price and puts out an enjoyable sound. Unlike the previously mentioned Bose Solo 5, LG Electronics LAS551H comes with wall mount brackets (included in the box) at no extra price. You can also add two extra wireless satellite speakers with this one and enjoy a complete surround sound like experience. Samsung HW-J551 are the most beautiful looking speaker set in our list of best soundbar under $300. Coming in two colors i.e. Silver and Black; the soundbar has a size of only 38 inches that happens to be ideal soundbar for 48 inch tv. It’s a 2.1 channel system which produces sound output of 320W. The subwoofer is 7 inches tall and has a minimalist and premium design. With a small size the subwoofer goes well with any kind of TV size unless; unless it isn’t less than 32 inches. It is the most discreet looking soundbar with a tubelight-like design. The subwoofer also has a compact design; you can tuck it somewhere near the TV table or next your sofa and totally forget about it; it could easily blend with design of any house. One important feature embedded intot this soundbar is the TV Sound Connect; which means if you own a Samsung TV, you can wirelessly connect this soundbar to your Samsung TV via Bluetooth and forget the hassles about cables and all. Other connections for Samsung HW-J551 include HDMI, Optical input, AUX input and also Bluetooth connection for your mobile or tablet device. Audio performance is excellent for this soundbar; with a sound output of 320W; this soundbar under $300 is loud, very loud to say the least. Even at loud volume; the sound doesn’t distorts, however don’t expect it to pull off slight details and variations in your music because it is a soundbar not a studio headphones or audiophile speakers. The Vizio SB4051-C0 is the first soundbar in our list that features a 5.1 Channel Speaker system. A bigger speaker system means larger audio range and better surround sound to say the least. This Certified Refurbished product is tested and certified by the manufacturer or by a third-party refurbisher to look and work like new, with limited to no signs of wear. The refurbishing process includes functionality testing, inspection, reconditioning and repackaging. The product ships with relevant accessories and may arrive in a generic white or brown box. …however in the past few years, the company has managed to carve out some incredible sounding home-audio solutions which not only sound great but also look awesome with a cheaper design. With a entire black body, and aluminum base design; this soundbar for music looks ultimately premium and adds a flavor of elegance to your TV and your room. If you look closely there is no LCD display on the soundbar and indications are only done via LED lights. But the genius thing Vizio did is, they included the LCD display on the remote control itself. However this could be a bad idea too as speaker remote generally gets lost due to being used occasionally. The subwoofer is wireless and connected to the soundbar; however the two external satellites aren’t wireless and required wired connections via the subwoofer. The only problem one would have is; the subwoofer adds more than required bass even when it’s set all down low. Check Full Review!